Konami has had a hard time catering to fans of the Castlevania series in the last few generations. It is a series deeply rooted in 2D gameplay, and adding a dimension some would say takes away the spirit of what made the earlier games great. 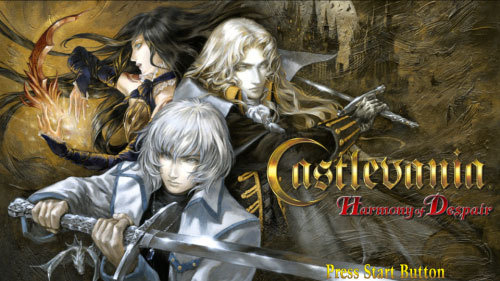 Konami has decided to appease both 2D and 3D supporters by releasing two Castlevania games, one of which brings the style of Symphony of the Night and the recent DS games back to the home consoles. In reality, it looks like a widescreen SNES or Genesis game in the best way possible. 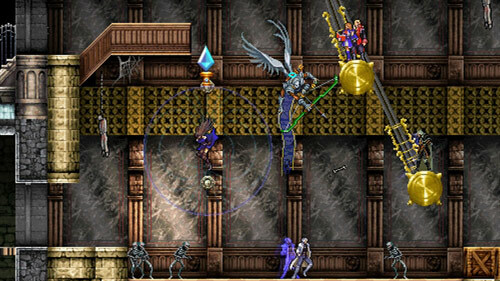 Castlevania: Harmony of Despair not only retains the level structure and gameplay from those games, but also the characters. Series creator Koji Igarashi didn’t just bring back classic themes, but also innovates on his formula. HoD doesn’t have just one main character but 5. You can also bring a total of 6 people (including yourself) into the castle to slay evil minions. As I mentioned before, vampire slayers from previous games play a part in Iga’s newest quest. Alucard from Symphony of the Night, Soma Cruz from Dawn of Sorrow, Jonathan and Charlotte from Portrait of Ruin, and Shanoa from Order of Ecclesia make up the cast. Each character brings their own attacks and special abilities to the game giving players the chance of having new experiences and strategies each time they pick up the controller. In my time with the game, a 10 minute mission to kill a big, ugly, beam blasting beast at the top of the castle, my biggest surprise was the camera system. With 6 avatars running around not everyone can, or wants to, be in the same place at the same time. Clicking the left analog stick zooms the camera out from its one room view to allow you to see more of the castle with another click giving the full view of the castle you’re in. It’s a wonderfully lets the player keep track of where they are going and where other players are. In addition, adjacent rooms can be seen by moving the right analog stick in the direction you wish to see. With as many as six players running about characters can be customized by avatar and color to distinguish who is who on the screen. Once in the world, items can be equipped to whomever you chose to increase stats and change attacks. 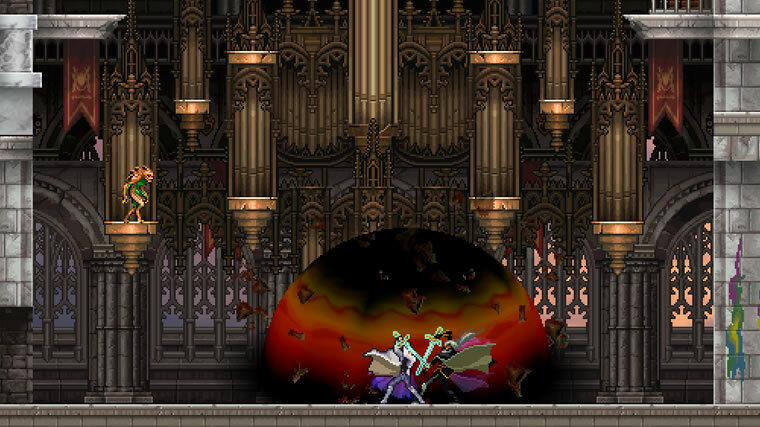 I took Alucard into the mission armed with his weapons and magic from his quest in SotN. Much is retained from the games that inspired this installment. 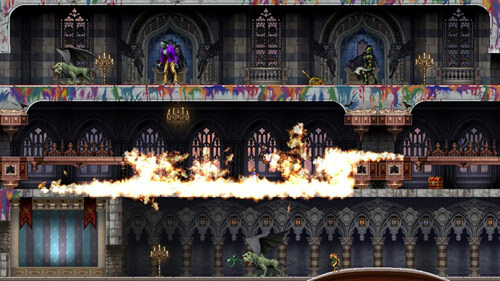 You run through one of 6 unique castles, avoid obstacles, kill demons, and gather items and gold. If you have played Castlevania before there is little that is new with the formula. Getting to my goal in the allotted time was a tough task to accomplish. 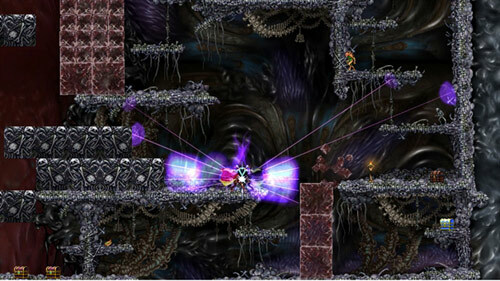 Castlevania has as much to do with exploration as it does with combat. My hopes of finding my way to the top were constantly extinguished by encountering areas that were only reachable when adventuring with others, which I was not. I was completely fine with this. It was cool to see what I could do if others were there with me, and that I could find my way solo if necessary. Even though I was not able to play with the cooperative and competitive multiplayer modes I see great potential in what Igarashi and company are putting together for the XBLA crowd. Castlevania: Harmony of Despair will be available for 1200 Microsoft points and is part of XBLA’s Summer of Arcade set to start in July.